Smart home gadgets are all the rage these days, with manufacturers and start-ups adding web connectivity to devices that have traditionally functioned without. Everything from refrigerators to toothbrushes has undergone a smart makeover, yet while the benefits of many devices are dubious, there are plenty of smart products that live up to their name. One category that makes a lot of sense for home users is security, and we're witnessing a surge of product launches now that the Google-owned Nest Cam has arrived on the scene. 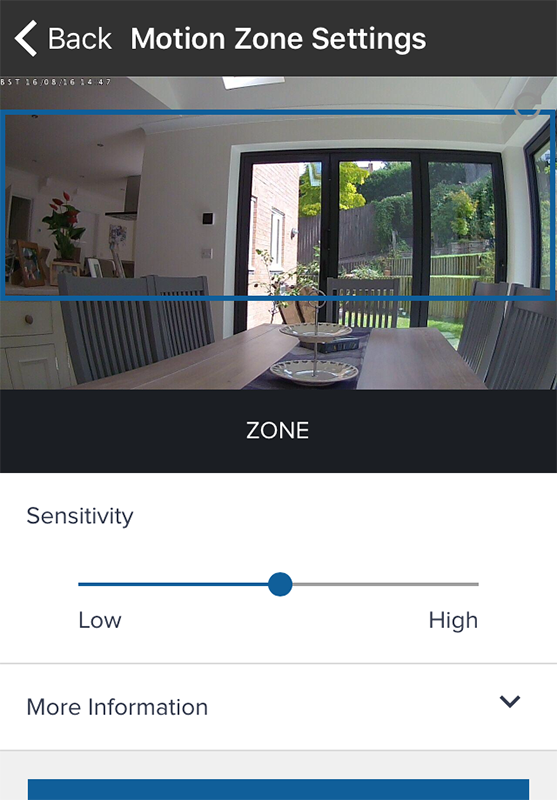 Competition is fierce, yet UK-based Y-cam has found success in this area having launched a range of connected cameras throughout the past decade. The firm's latest model, Y-cam Evo, is under the microscope today. Priced at £130 and introduced as a smaller, sleeker alternative to the older HomeMonitor HD, Evo measures just 52mm x 52mm x 57mm in size and weighs a paltry 49g. Overall height climbs to 70mm with the stand attached, while weight increases to 96g, yet even so, this is one of the smallest connected security cameras we've ever tested. Evo is a nice-looking thing, too, with a white body circled in matte silver. A solitary USB jack around back serves as the power connector, while the stand attaches using a standard tripod screw thread, and the Ethernet port required on older models for initial setup has fallen by the wayside. As is the case with most modern gizmos, out-the-box configuration process is controlled entirely via an app. The stand's ability to tilt and swivel make it easy to position the camera in a suitable location, and there's also a small metal wall/ceiling bracket included in the bundle, along with screws and wall plugs, to which the stand can be magnetically attached. The tilt mechanism doesn't, however, appear to be the most robust - our review sample has already developed a tendency to droop - and though the camera is admirably small, it isn't inconspicuous due to the green status LED on its front. We appreciate knowing that the camera is working correctly, but we'd like to see an option for the LED to illuminate only when motion is detected, or to have no light during everyday use and a red LED on the rare occasion when there's a fault. Y-cam has its sights set on mainstream consumers and has designed Evo to be simple to setup for just about anyone. Well, we say anyone, but there are three requirements; a compatible iPhone, iPad or Android device; an Internet connection with an upload speed of at least 0.5Mbps; and a home Wi-Fi network with WPA or WPA2 security. Chances are, if you're reading this, you're able to tick all three of those boxes. 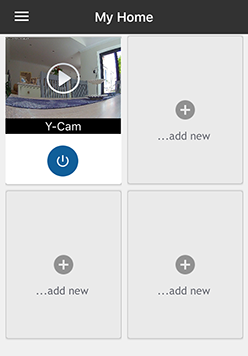 Getting up and running is as easy as downloading the Y-cam app (available for Android or iOS), plugging the camera into mains socket using the supplied three-metre USB adapter and following the on-screen wizard. 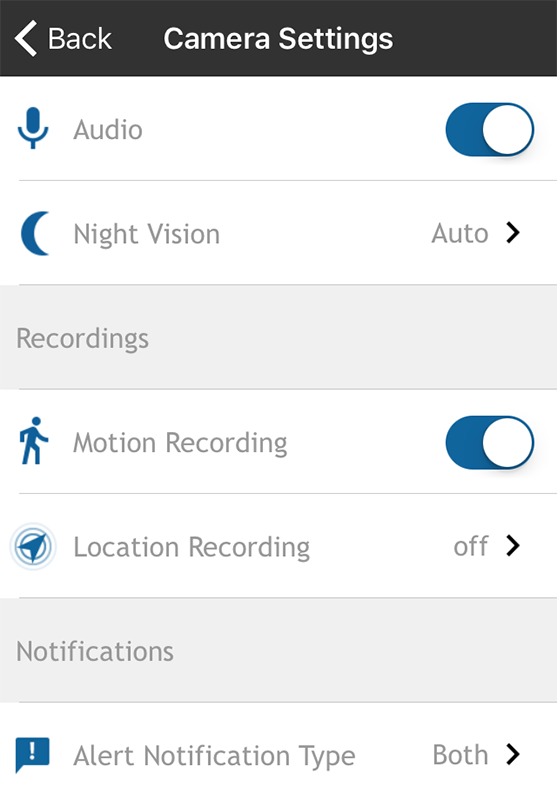 Following registration and account creation, the app first connects to the camera using Bluetooth, after which it collects Wi-Fi details and connects to your preferred network. The entire process takes a matter of minutes, and once up and running, you're dropped into a home screen that lets you choose the camera you wish to control or view. Y-cam is obviously keen to encourage users to add more cameras to their network, but there are no ads and the app is generally clean and concise in its presentation. Cameras can be named to help identify locations, and selecting a camera brings up a live view above a list of recent recordings triggered by motion. Record and snapshot shortcuts make it easy to trigger actions manually, and switching to a full-screen view is achieved by rotating your smartphone/tablet to its side. Most users will, we suspect, be happy to leave it at that and let Evo do its work in its default configuration, however there are additional options for those wanting to delve into the sub-sections available via a hamburger menu. My Videos lists a recording history, with a helpful calendar view, Account Settings lets you change password and add additional email addresses - useful if you want notifications to be sent to work, or other family members - and Camera Settings lets you tweak each individual camera. 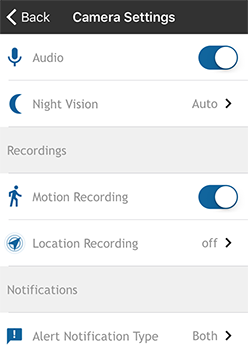 Available options will vary depending on camera type, with Evo allowing for audio toggle, night vision on, off or auto, as well as motion recording set via a user-defined zone. Setting the monitored area is as simple as dragging a box across the screen, and we like the fact that Y-Cam uses an integrated memory buffer to allow playback a few seconds before motion was first detected. How good is the picture quality? Well, it's decent but not spectacular. 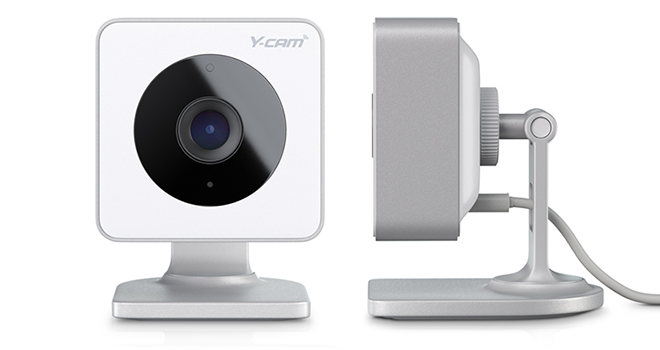 Y-cam offers a 1,280 x 720 resolution with a 100° field of view and the ability to capture video at 15 frames per second. The camera is described as HD, but a 720p resolution can be considered basic by today's standards, and we're a tad disappointed to find that Y-cam hasn't made the transition to 1080p. Recorded images and pictures can appear somewhat grainy during broad daylight, though the camera fares reasonably well at night, with the built-in, high-power infrared LED providing good clarity at a range of up to eight metres. 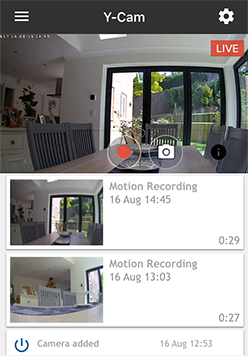 Audio quality, as you might expect from the small integrated microphone, is basic but sufficient for picking up nearby chatter or any sign of noise in a baby's room - handy should you choose to use the camera as a baby monitor.